While other dental offices are happy to simply fix cavities and damaged teeth as they develop, the team at ProSmiles Dental & Orthodontics strives to help each patient avoid these common dental problems so they can spend more time enjoying their smiles and less in the dental chair! 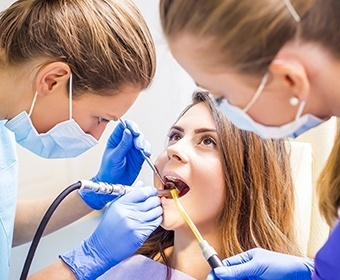 Using the services detailed below, we’re able to catch and treat minor dental issues as early as possible, saving our patients from having to get undergo more involved procedures over time. Thanks to our preventive approach, we’re able to look after our patients’ smiles and wallets at the same time! Whether someone is 3 or 103, we recommend that they should receive at least two checkups and cleanings per year. Why? 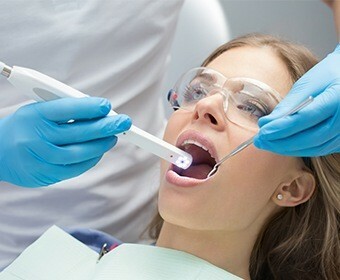 Because these appointments not only give our hygiene team the chance to remove any harmful plaque and tartar from the mouth that can cause cavities, but they also enable our dentists to find dental decay and damage as soon as possible and take care of it before it can cause a major headache. We can also help a patient put together the perfect homecare regimen so they can keep their teeth healthy between appointments. While we welcome growing smiles into our practice, our team also has the experience and expertise to meet all of the potential needs of adult patients. 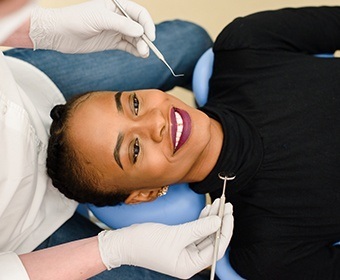 We’re able to provide a wide array of preventive, restorative, and cosmetic services, meaning whether someone wants to maintain, repair, or improve their smile, they can always trust us to have them covered. We’re even able to provide all-inclusive dental implant care to help patients recover their lost teeth with the most advanced solution available today. Tens of thousands of people are diagnosed with oral cancer in America every year, and up to 25% of them actually don’t engage in known risky behaviors like using tobacco or drinking excessively. Oral cancer can affect absolutely anyone, and to make sure our patients are able to get treatment as early as possible, we always perform an oral cancer screening during routine checkups. Our team is able to spot even the slightest signs of cancerous or precancerous tissues, and if necessary, we can arrange for a biopsy so a patient can get what they need right away. Do you normally wake up with a sore jaw or dull headache? Do your teeth appear flat and worn down? If so, then you might be unconsciously grinding your teeth while you sleep, which is called bruxism. This can be severely damaging to both the teeth and any existing dental restorations over time, but a solution is easily available here at ProSmiles. 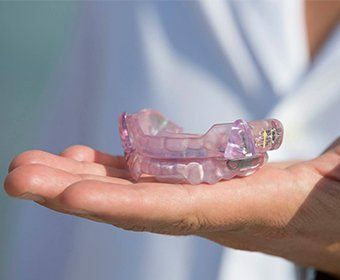 We can provide a patient with something called a nightguard, which is a small, custom-made oral appliance that prevents the teeth from rubbing together during sleep.